Do you know the difference? I finally do, but it took a while seeing many of them before it sunk in. 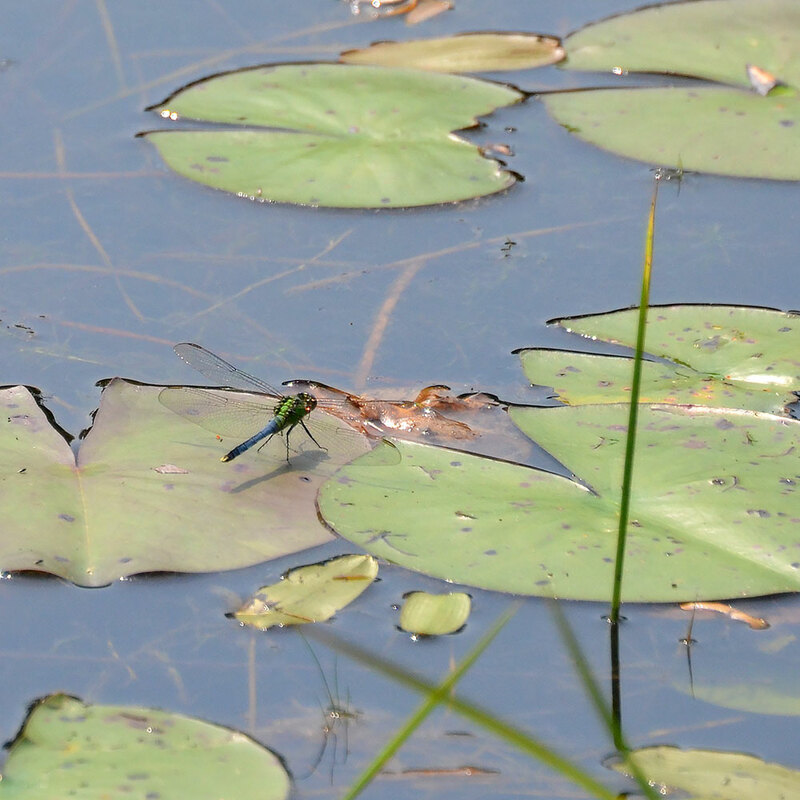 First thing I noticed was the dragonflies are porky compared to the slender damselflies. Next thing I saw that was different was the way they positioned their wings at rest. 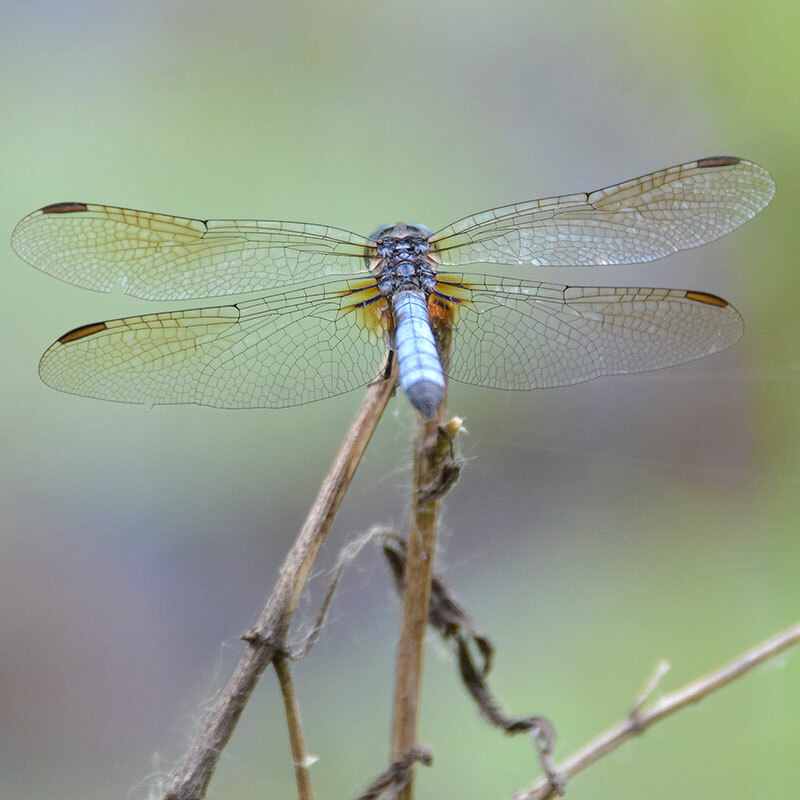 The dragonfly looks like an airplane. 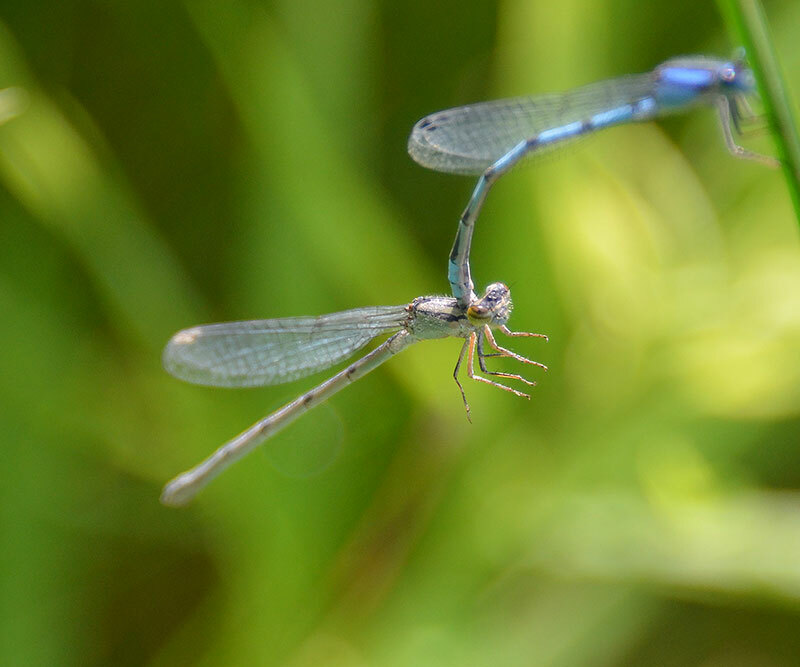 The damselfly points them skyward or backwards and they are held together. The eyes are different too. 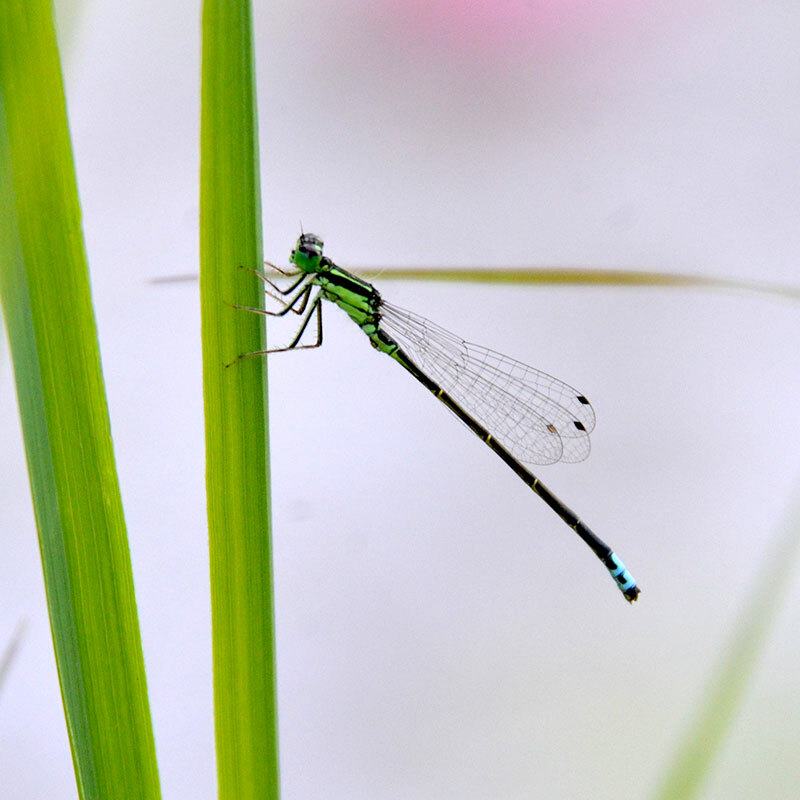 The damselfly has two big, separately spaced eyes. 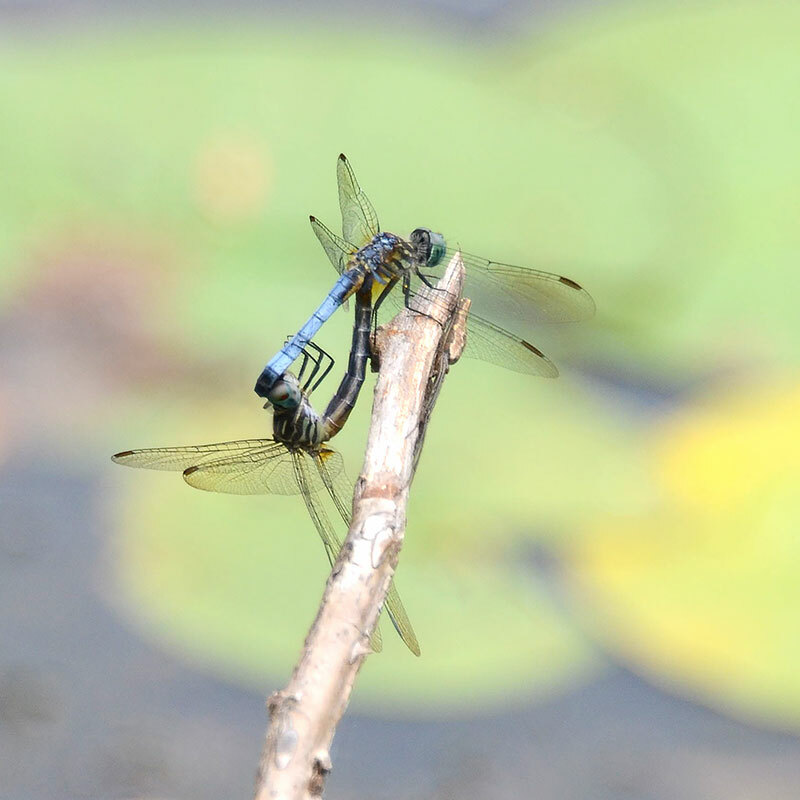 The dragonfly, the eyes run into each other. See how they meet at the top in the image below? Both come in lots of colors. It really is like finding a prize when a new variety is spotted. And both do the nasty in a similar way. I bet you did not think I was heading in that direction! Getting a theme here? 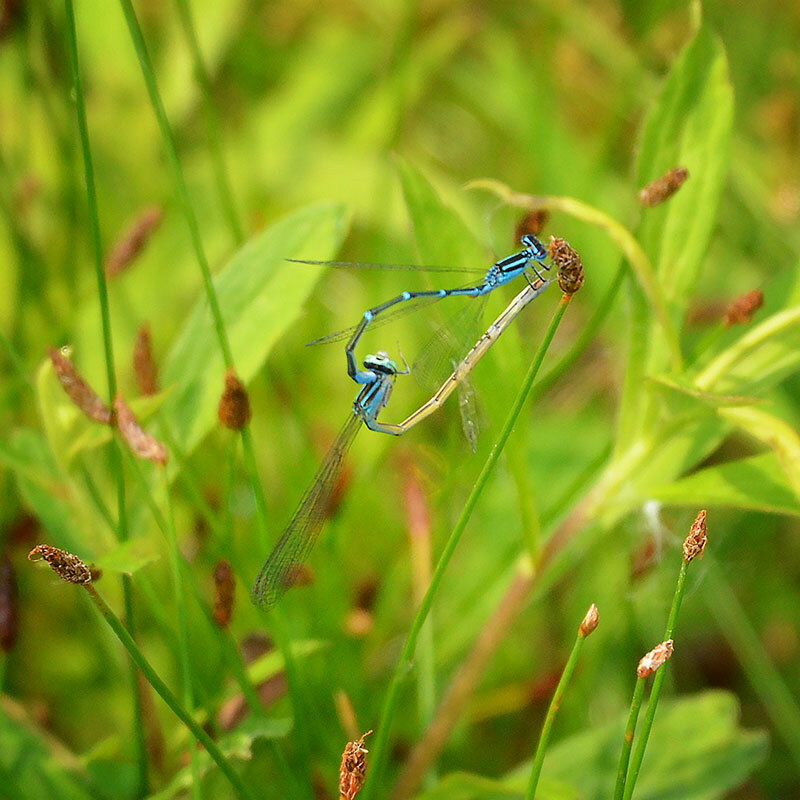 I keep running into insects in the middle of their private moments. Did you see on GWGT the two Red Milkweed Beetles. I got the dirtiest look from the female. 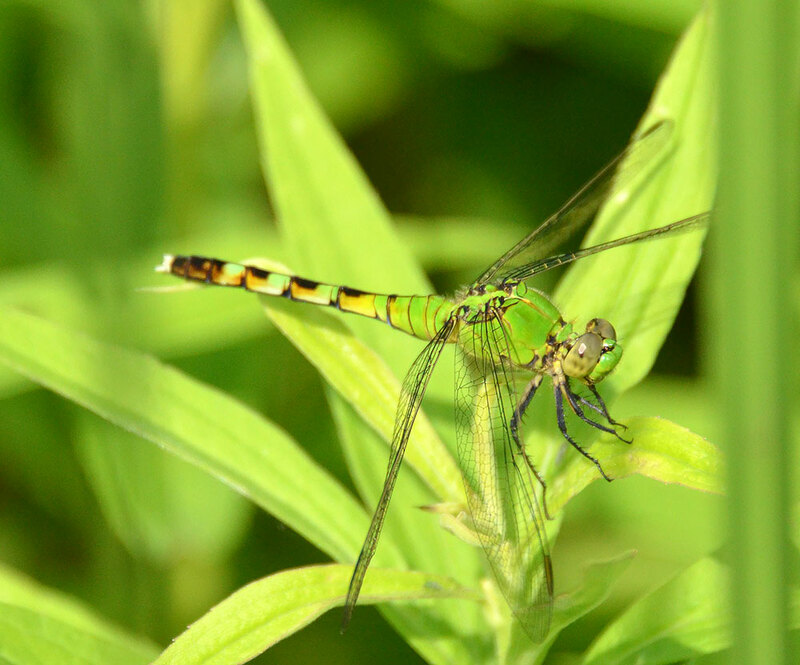 Also don’t miss last post, Dragonflies in Gold. 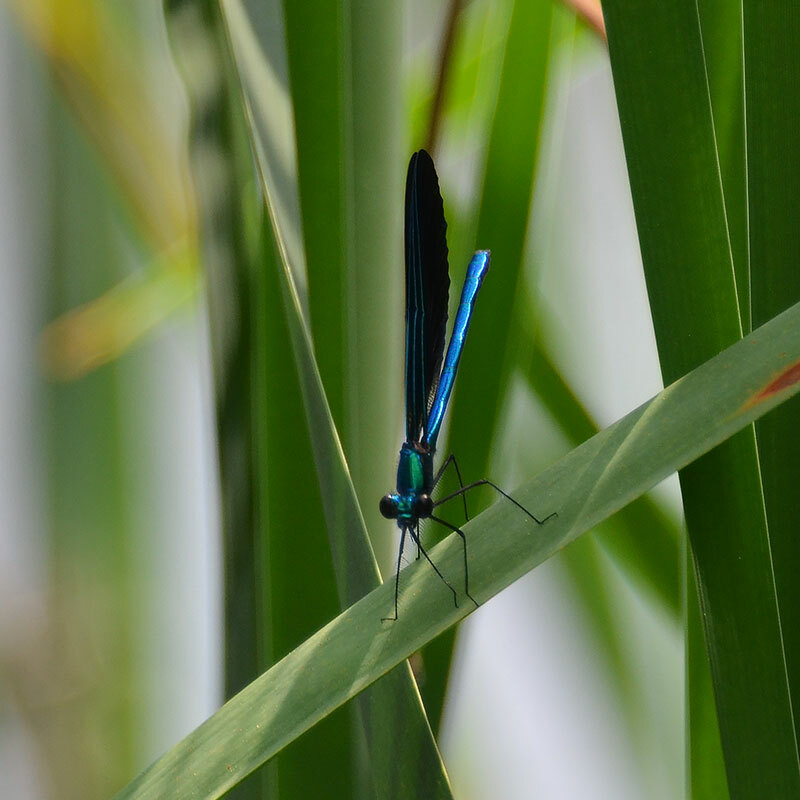 This entry was posted in Dragonflies, Macro photography, Nature, Photography and tagged damselflies, Difference between dragonflies and damselflies, Dragonflies, dragonflies mating, Nature, Photography, Photos, pictures of dragonflies. Bookmark the permalink. Great post Donna. Happy to see this subject embraced and captured so well in a popular and widely read blog like yours! Ha! I am only hoping Nature and Wildlife Pics becomes popular like GWGT. It is a hard “market” to break into with all the fine photographers and naturalists. I don’t think of myself as either, but I do like to learn, observe and understand. I also like to be in nature. That’s amazing. I never would have thought that those animals could contort their bodies that way. Stupendous shots! I had to laugh seeing them. The last one, that guy got no pleasure. She just carried him around hanging in midair. Poor buck. I was not sure if he knew what to do. Wonderful shots and a great explanation about some of my favorite creatures. A lot of folks haven’t really thought about the differences and lump them all together. Just an explanation as how I learned them by observing. I think I would like entomology, but it really is learning a lot of subtle differences. That is what makes identifying them so difficult. You are such an excellent photographer. Very impressive. I love your blog!!! Thank you Levi. I like finding new things or things you see everyday and just looking a bit closer. You re excellent at it. I’m writing about the robin for tomorrow’s post. Have a great day, Donna!! Wonderful shots. Thanks for explaining the difference. I know there are more technical differences, but these are just ones I observed. I am sure a bug specialist could add all kinds of differences. Ha Ha! Glad you explained the difference and I agree, it is quite fun to discover a new colour. I do love the variety of colors. 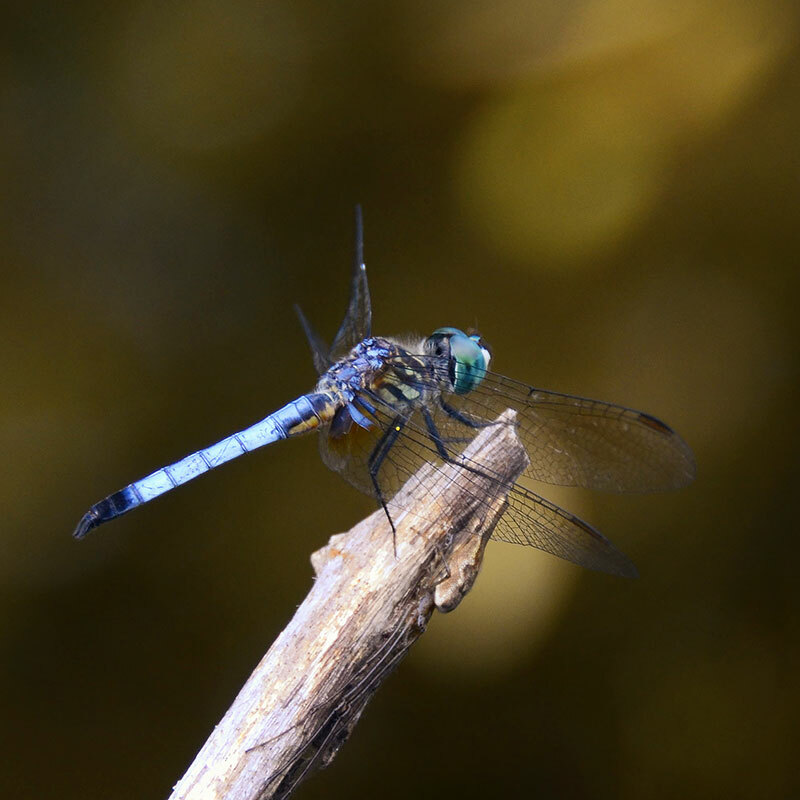 What a wonderful tutorial on dragonflies and damselflies. The photos are spectacular.